On the Southwest corner of Ontario and Rockwell, an unassuming 10 story building completes the Key Center complex. This is the Society for Savings Building, established in 1889 by architect John Wellborn Root. 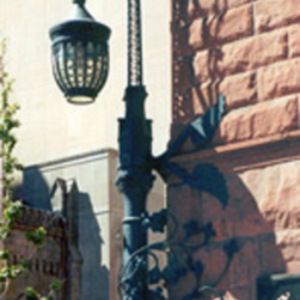 On the very corner of the Savings Building is an ornate, wrought-iron lamp post. The post itself is about 15 feet tall, with the light dangling at about 10 feet. The post is sturdy and detailed, affixed to the side of the building with wrought-iron ivy. The electric lamp is round and ribbed, a remarkable contrast to the spindly, curling forms of the support. The natural contours and lines created by the ivy, along with the spherical fixture and the curling iron top are curiously Art Deco in appearance, despite being 30 years ahead of the style. The Society for Savings Building was the first skyscraper in Cleveland, and the tallest building in the city for some time. The lamp post that stands conspicuously out, marking this building, is a vestige of the innovative leader that Cleveland had been at the turn of the twentieth century. 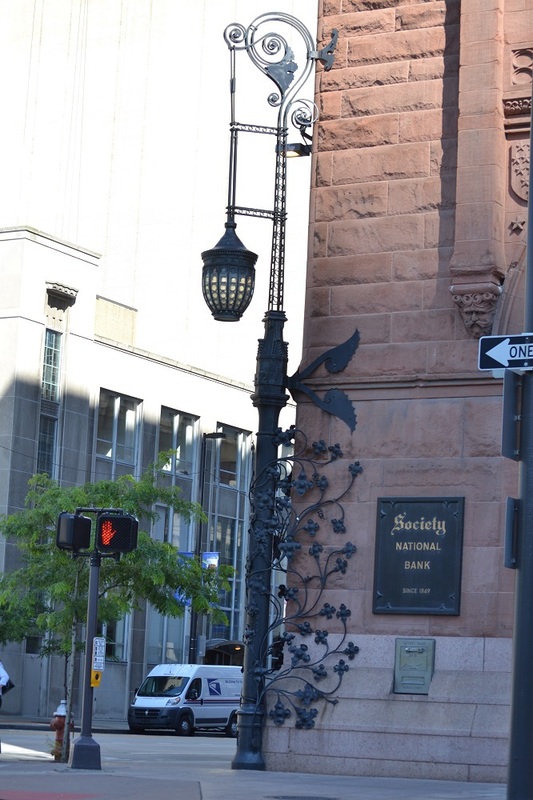 The lamp may be a reminder that Euclid Avenue was the first street in the world lit up by electric lamps, which would all have been similar in style and function as the one that still stands today just outside Public Square. : John Wellborn Root, “Street Lamp,” Ohio Outdoor Sculpture Inventory, accessed April 20, 2019, http://oosi.sculpturecenter.org/items/show/173.